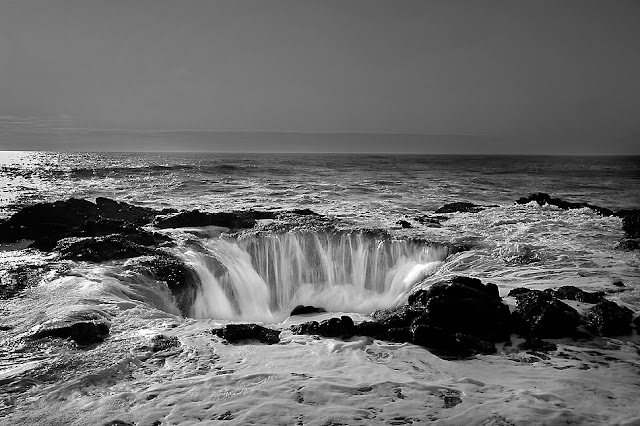 "About half way down the Oregon coast there is this place informally named Thor’s well, it’s umm, a hole. It’s not your ordinary hole, this one doesn’t fill up, so it must have a drain, but looking at it a drain would be below sea level and therefore defy the laws of physics. The mesmerizing ebb and flow of water into the hole takes place during a very rough surf and nearly high tide. In between shots you have to clean the lens of ocean spray while balancing in a strong wind on very sharp rocks. It can be dangerous and it’s perfectly clear to me that if the current pulls you into that hole you are not coming out alive."